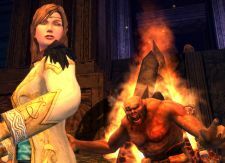 Massively Speaking Episode 34 is all about Lord of the Rings Online and the game's first expansion, Mines of Moria. Shawn and Michael are joined by Jeffrey Steefel, Producer at Turbine, to talk about the new classes, content, and dungeon-crawling goodness added in this gigantic expansion. They even talk about the future of the game a bit! Well worth checking out. Massively Speaking Podcast Episode 34 originally appeared on Massively on Thu, 04 Dec 2008 09:30:00 EST. Please see our terms for use of feeds. That's what I tell people when they finally try LotRO and they love it. It's not for everyone but I have to hand it to the guys at Turbine, they are working VERY hard to make LotRO the best game out there. Also, Mike, heres wishing your wife a speedy recovery! Food for thought guys, thanks for that! I think the "holy trinity" of tank, healer, dps, might actually tie into your later discussion about anime and art styles - and how this relates to types of combat in games. I too think there should be more variety in the types of classes that fulfill the tank, healer, dps roles - but if you go too far in mixing it up with the crazy "elf chick who turns into a bear" you're then talking about changing the world of the game you're playing. What am I getting at? Okay, realism. The tank wears plate armor and has a shield because "realistically" that's what a guy who can soak up damage would need to wear in a pseudo-medieval fantasy world. You can vary that a little (the druid in WOW for instance) but everyone still knows the guy in plate with the kite shield - he's the archetype and while he's in place as a class, doing his thing, the world of a particular fantasy game is "grounded." It is the same with fantasy literature. Why do people read fantasy books by authors other than JRR Tolkien? Familiarity. A little variation is good - too much and you're not reading the type of book you expected to to read. Probably all genre fiction (and games), from film noir to fantasy, are "variations on a theme". So, change things to much and you've left the genre you're working in. I am sure one of the reasons fantasy far outstrips any other setting for mmos must be that it is easy to understand. It has its own "code". The generic fantasy code. So, if the developers change the code at their end, they do so at the risk players wont be able to decipher what they come up with. Stretching a metaphor their. And rambling. So I'll stop now. Great show - thanks for that. Sorry - the above comment was in response to MMOG Nation 15! Enjoyed the interview with Jeffrey here though. Great stuff! Why do people read fantasy books by authors other than JRR Tolkien? Why do people read fantasy books by authors other than Robert E Howard since he kicked off the fantasy and sword and sorcery genre, not Tolkien.